Skeptics write off demonic possession as a convenient scapegoat for the deranged and criminally inclined. Unfortunately, however, it is all too often real, irrefutable and terrible in its otherworldly candor. 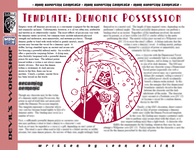 The exact effects of possession vary with the demonic entity involved, but common traits include enhanced physical strength and endurance, near-immortality, and extreme psychosis. Though demons prefer to bond with weak-willed or greedy mortals, nearly anyone may become the vessel for a demonic spirit. A drifter, having stumbled upon an ancient and arcane artifact housing a powerful infernal entity. An occultist, after a spectacular conjuring failure. A dying man, who foolishly bargained with a powerful demon prince for more time. The infernal power housed within a victim is not always immediately obvious. But once the demon within is awakened, its dark persona drawn to the fore, there can be no mistake. Clearly, a potent, sinister force has been loosed on the world.